'Little Burlees', the Edward T. Cockcroft estate designed by Albro & Lindeberg c. 1905 in East Hampton. Click HERE for more on 'Little Burlees'. 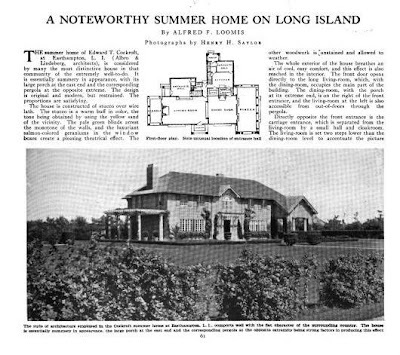 Article from Country Life, 1911. Again, sheer perfection. Who could want anything more at the beach? A perfectly sized, perfectly appropriate house. 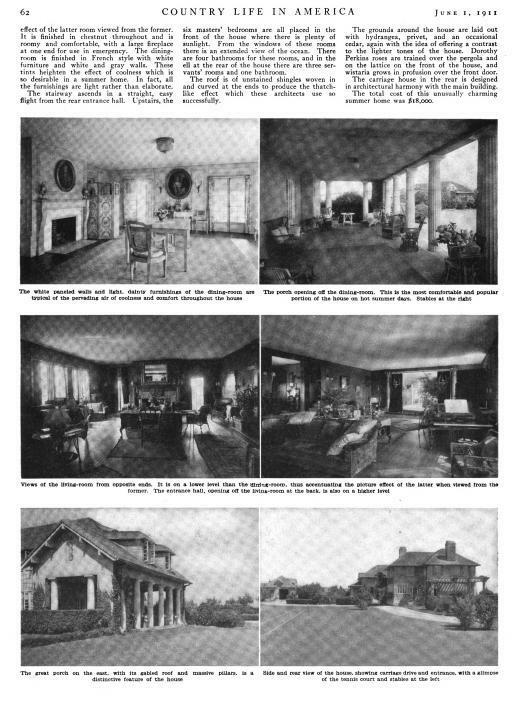 No "media room" or double or triple height "great room" needed- then or now. I’m grateful Zach is able to supply a ground floor plan – with the original front door opening directly into the living room the decision to relocate the front door around back may not have been a terrible thing (my opinion). I can see where the owners hopefully created a new entry space while leaving the front rooms of the house exactly as-was, including the staircase. In the 1907 /1911 photos this looks like a really comfortable not-too-formal house; as Magnus said: perfect for the beach. Off subject. I'm trying to find "Strawberry Fields" and it's not coming up in the search engine...can someone direct me? Thank you. The description of the exterior with the coloring of the stucco and the natural wood is interesting. Also, the reasoning behind the raising of the dining room on the flat lot. And the mention of a carriage entrance at this date. I cannot for the life of me understand why anyone would tinker with such a home. After a great deal of skilled thought the architects created this home to mate perfectly with the setting. It looks to have been logically laid out, per the floor plans, and generous in size without being overwhelming. An aside on the author of that Country Life profile article - Alfred F. Loomis. See the link below to his papers. He was a yachtsman first and writer second. Doug, are we looking at the same floor plan? In my reading, the entrance then, as now, accessed from the driveway, was at the side, into a large square entrance hall by which one descended a few steps into the living room. The front door did not then access the drive, and was simply, in those pre-Marving sliding door days, the entrance to the terrace and grounds, with a path to the street. An architectural feature, not the main entrance. Last night I had dinner at a grand old seaside house with practically identical arrangement, the symbolically grandest entrance door being the door to the terrace directly from the drawing room, but the real entrance at the side. D.E.D., you are absolutely correct (as always!) about the door to the garden on the front of the house. What threw Doug off was the text of the article that refers to that as the front door opening directly to the Living Room. I am viewing this on my iPhone and cannot read the labels on the floor plan clearly, but I think that space in the upper left-hand corner, three steps up from the Living Room, is the Entrance Hall with stairs to the second floor. Hopefully, Zach will verify. In my own new house design, I sometimes use the same parti, with the auto entrance on the back and the garden on the front. It might be sometimes confusing looking at the floor plan, but makes more sense in reality; that is the case in this instance, with the garden in the front and the ocean across the road. For the bloody life of me I cannot find the magazine this house was recently featured in---wouldn't you know I'd have one of my rare fits of taking magazines to the recycling---but it was either AD or Elle Decor, I suspect, and as I mentioned yesterday it was full of the usual blather about how even though the original house was terrific we kept it the same by changing it. Oh. Gotcha. Correction, if you are travelling south on piping rock rd, strawberry fields would be on the right hand side of the road. Thank you Anon 1:45...still having trouble finding it on Bing or Google Earth.....I thought it was posted on this site somewhere. Strawberry Fields is on Oyster Bay Rd, across from Planting Fields. Strawberry Fields was originally named Airdrie, the Fish estate by Delano & Aldrich on the west side Chicken Valley Rd, south of Oyster Bay Rd and north of Planting Fields Rd. What JAMES SAID is correct , Shrubbery fields, I mean, Strawberry fields is on Chicken Valley Rd. Thank you very much everybody regarding Strawberry Fields...it was driving me crazy that I couldn't find it on BING or Google Earth...very handsome house, as was the original "Little Burlees"...why anyone would raize a perfect home to just build another almost identical is beyond normal reason. More money than sense. Gin Lane, East Hampton is not as much about quiet quality as maybe it once was. And new money doesn't appreciate patina. But my guess is that someone, with financial gain, convinced the owners it would be better to build new than renovate.